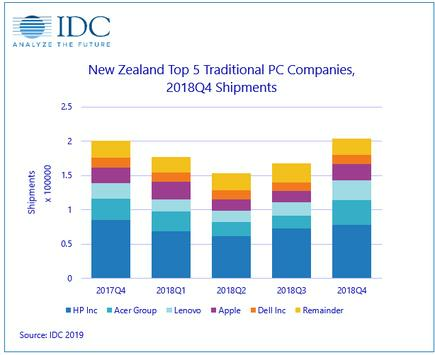 IDC says New Zealand's PC market experienced a 1.5 percent year-on-year growth in unit shipments in Q4 of 2018, the second quarter of growth after three consecutive quarters of decline, but it expects a decline in 2019. Overall shipments of commercial PC devices grew 2.4 percent in 2018 while consumer device shipments shrank 7.9 percent. Liam Landon, associate market analyst at IDC New Zealand said New Zealanders were no longer feeling the need to own a PC, phone and tablet, with one or two devices now able to satisfy their needs. However, he said consumer sales of ultraslim and gaming notebooks both grew in 2018. Landon said the end of support for Windows 7 had boosted PC sales in the business market. "Overall, commercial organisations, particularly in the second half of the year, saw increased demand. However, Intel’s CPU shortage delayed shipments, predominantly on low end commercial devices, stemmed growth in 2018Q4." IDC expects this shortage to continue to impact the market in 2019. It predicts New Zealand’s traditional PC market will decline by 4.4 percent YoY in 2019.